Camp Hopson can help you move house from start to finish with the kind of care and regard it’s sometimes hard to find. Coming to you with seven decades of experience, there’s nothing we haven’t learned about how to relocate people without causing excessive disruption to their lives. Our moves are well-planned and structured so that you’re calmly installed in your new premises and able to enjoy your new surroundings straight away. With stress and upheaval on the back burner, you can breathe a sigh of relief and get on with living life. We’re a removals company in Hungerford that’s unlike any other. And because we’re familiar with the area and its lanes and backstreets, we can get you from A to B in record time. Our staff of BAR (British Association of Removers)-trained drivers, movers, handlers and packers won’t put a foot wrong as they help you get ready. We offer full packing and unpacking services to help take the weight off your shoulders and we know how to look after fragile and specialist items, including furniture and pianos, so that everything is safe in transit. We take special care when hauling boxes out of your old home not to bash paintwork or damage carpets and banisters. Removals in Hungerford don’t need to be soul-sapping or exhausting – we’ll supply you with the moving checklist we’ve created so that nothing gets forgotten or done with nervous haste. If you need storage in Hungerford, you may have found in the past that it was thin on the ground. No longer. Our facilities are first-rate for all kinds of needs. Whether you want to store large quantities of furniture or just a few miscellaneous items, we can accommodate you. We carefully categorise everything you entrust to us and maintain a formidably organised inventory. When you need your goods back, they’ll be delivered straight to your door. Expertise can only be acquired with time – seventy years, to be precise. 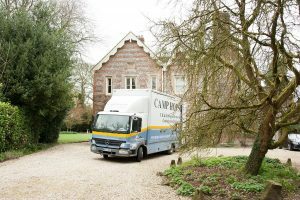 From the moment our estimator pays you a call to establish the details of your move, you’ll feel the Camp Hopson difference – that elusive sensation that tells you you’re in safe hands. A move with us is a move in the right direction.